George Clooney (The Descendants) directed, co-wrote and stars in The Monuments Men, which tells a true story from World War II. 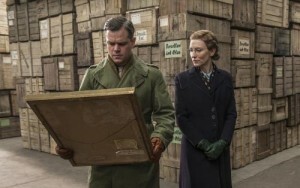 Based on the book by Robert M. Edsel, the drama movie follows the exploits of an aging U.S. platoon who are assigned to track down, steal and return priceless pieces of art that were stolen by Nazis. 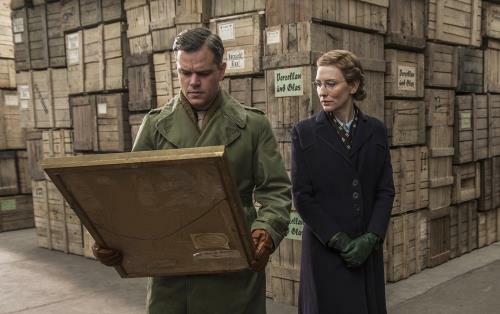 Matt Damon (Elysium), Bill Murray (Get Low), Cate Blanchett (Blue Jasmine), John Goodman (TV’s Treme), Hugh Bonneville (Agatha Christie’s Poirot: Murder on the Orient Express) and Bob Balaban (Girl Most Likely) co-star in the war film. Despite all the name actors, moviegoers gave PG-13 The Monuments Men mixed reviews, with 50% approval, according to Rotten Tomatoes. Critics weren’t so kind, awarding the film only 33%. Still the movie grossed a tidy $76.6 million at the box office. and featurette “Marshaling the Cast,” a cast discussion about the real men and women they brought to life.